This is part VI of XXI of a detailed analysis of Glenn Beck's newest book, Broke: The Plan to Restore Our Trust, Truth and Treasure, co-written with the help of Kevin Balfe. Keep in mind that it was published on 10/16/11, one month before Beck admitted complete ignorance "with the economy." Chapter 6 is entitled "Hoover, Keynes and FDR, The Three Horsemen of the Progressive Apocalypse." Weird, this is the first that Republican Hoover has been deemed "progressive," but that is how Glenn Beck rolls. If a politician employs government to the service of economic growth, restoration or recovery, it's "catastrophe" for Beck's far, reactionary right wing perspective. Beck's small government perspective considers even George W. Bush a "progressive," and his "history" in this chapter ignores some inconvenient facts that do not comport with his point of view. Glenn Beck = federal government? Chapter 6 begins with a quotation from FDR which is cited in a text of one of Beck's occasional guests, Burton Fulson. (1) Roosevelt actually did say, "We seldom know, six weeks in advace, what we are going to do;" but a friend of Beck's, who will not admit that Beck is engaged on his Fox show in propaganda, is someone to fact check for accuracy. Most, perhaps all, of the books cited in the Citations section of Broke are written by authors on the right side of the political spectrum. That doesn't necessarily mean that Broke is flawed; it's just not an objective analysis of the past that Beck is "analyzing" in "Part One: The Past is Prologue." Beck bemoans that President Herbert Hoover, and engineer by training, was one of the nation's "cognitive elite. "(3) Because Beck reveres the Founding Fathers of the United States, he never attaches that phrase to them even though the men who hammered out the Constitution in Philadelphia that hot summer of 1787 were the "cognitive elite" of that era (minus Thomas Jefferson who was then the U.S. minister to France). (4) This is a double standard the pervades much of Beck's anti-intellectual, anti-elitism that is occasionally expressed by him. Beck claims that Hoover "hiked tariffs on imported goods, unleashed government spending, spearheaded new social programs and championed massive tax increases." A self described progressive and reformer, Hoover advocated tax cuts for low-income Americans (not enacted), a fact Beck ignores. The new "social program" that was actually enacted by Congress in Hoover's time was farm subsidies. Hoover advocated for a small retirement pension, proposed a Department of Education and loans for urban slum clearances, but none of these were enacted into law. When Beck writes that Hoover "spearheaded new social programs" that is technically true even though virtually none of his proposed programs were established as law by Congress. (5) Maybe the title of this chapter should have been "Propaganda About Hoover, Keynes and FDR...." which is true about much of what Beck says and writes. Beck spends most of the chapter "throwing darts" are "economic philosopher" John Maynard Keyes and President Franklin Roosevelt. Ironically Beck segues into these sections by noting that "the backlash that America is so famous for should have been in full effect...." In these times Glenn Beck is the central character of The Backlash against President Obama's liberal reforms, and it's no accident that this transition section of the chapter is subtitled, "Change We Can Believe In," an Obama campaign slogan. The deceptions of this chapter are perhaps highlighted in a side bar that Beck calls a "Teachable Moment." In it Beck claims that Obama has "an apparent 'war' on free-market capitalism...." Of course, this is the deceitful, yellow propaganda that Beck has been engaged in since Obama's inauguration in 2009. President Obama fiercely supports the free market(13) and understands government spending to be a bridge to sustained, market driven, economic growth. Beck continues in this side bar to claim that "President Obama's decision to appoint people without much private-sector experience is very much in keeping with a Roosevelt-esque view of who is best equipped to run the country. "(14) So that explains why Obama had so many economic advisors taken from Goldman-Sachs! Another hypocrisy on Beck's part comes from the subtitle of the section of the chapter this "Teachable Moment" is part of: "Smithboating Adam Smith." Smithboating is a play on the word swift-boating, a smear campaign against 2004 presidential, Democratic candidate, John Kerry. "Swift-boating" is a euphemism for the spreading of lies through the media, and this "Teachable Moment" indeed swift-boated President Obama! Next to telling lies, hypocrisy is Glenn Beck's greatest character flaw. 100% in this chart is located about where the top of the "m" in "Obama" is on the graph. 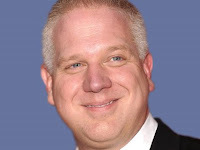 If there is a "Teachable Moment" in Beck's teachable moments, it can be stated succinctly, "Don't believe anything expressed by Glenn Beck with checking his 'facts!' "
One last point will demonstrate how Beck chooses to tell his story about the Great Depression. In the final section entitled "The Ultimate Stimulus Plan" Beck notes that "While the top [income] tax rate increased six percentage points from 1943 to 1944, the amount of tax revenues collected soared 82 percent." Beck does not translate this: a small increase in the marginal, top tax rates creates substantial improvement in the revenues collected. Beck goes on to note that "the debt went from $659 billion in 1940 [in 2009 dollars] to a jaw-dropping $3 trillion in 1946. The debt would not reach those heights again for another thirty-eight years. "(17) Beck knows that a major war was underway, but he doesn't argue against budget-busting foreign entanglements as the Founders he so reveres did. Also, the president that brought about the massive deficits thirty-eight years later was Beck's hero, Ronald Reagan. Beck did not mention that significant fact either. See Chapter 7, "The 1960s and '70s: A Summer of Love, Two Decades of Spending"